Fairbanks wasn’t entirely sure why. She wasn’t an all-state high-school player. At 6-1, she was a bit undersized for a major-college post player. Her prep stats, 15 points per game as a junior, 19 as a senior, were very good but not spectacular. E-town is not a traditional girls’ basketball power, and in Fairbanks’ senior year lost in the first round of both the Lancaster-Lebanon League and District Three playoffs. The WNBA is bringing its first preseason tournament to Florida. The defending league champion Minnesota Lynx, Chicago Sky, Indiana Fever and Phoenix Mercury are set to tip off the four-game tournament May 9 at ESPN Wide World of Sports Complex at Walt Disney World. Winners from the opening games will meet May 11, with the other two teams playing in a consolation game. The Blackman High girls’ basketball team made history in March 2014 winning the school’s first state team championship. This convincing display of athletic dominance came exactly 90 years after the girls of Central High School (CHS) brought Rutherford County its first state basketball title. As a precursor to the state championship, the CHS 1923 team won the Middle Tennessee Athletic Association championship. The coach was W. R. Romine, who doubled as the CHS manual training instructor. The team was captained by Ida Lee Byrn; India Gannaway served as the team manager. WNBA Legend Tina Thompson arrived in Manila yesterday to lead the Jr.NBA/Jr.WNBA Presented by Alaska National Training Camp. She will help coach participants from all over the country vying to become Jr. NBA/Jr. WNBA All-Stars. Watching your son and his Rutgers basketball teammates in a headline-making video shown on ESPN is akin to the moments before a car crash. The coach is hurling balls at the players, shoving them hard enough to send them sprawling on the court and spewing vile insults. Time crawls as you view a reality too disturbing to process. Your son imparts only the barest of information. You do not have a full picture of the environment these kids are being subjected to every day, but you’ve heard disturbing stories about what happens at practice and you know a lot of players are depressed — a common symptom of emotional abuse. Yet you feel helpless. Speaking up will only make you sound like a whiny, entitled mother complaining about the coach’s treatment of her son. Ditto for the other families. Triple ditto for the players. But here, finally, is justification for your emotions. This video confirms your fears. The car crash is real. And they should also read the comments…..
What’s the balance between motivation and bullying? Nine student-athletes have transferred from Butler University’s women’s basketball program over the past four academic years. Additionally, four coaches have left the program and five players have chosen not to return over the last five seasons. Four of those student-athletes— juniors Taylor Schippers and Liz Stratman, sophomore Haley Howard and freshman Ashton Feldhaus—announced their intention to transfer from the program within the last month. Some players are now alleging verbal abuse, a lack of team control by the coaching staff, and players being required to participate in practices and games while injured or sick. The allegations come from former players who were with the program as far back as 2007. So, about that championship game. Yah, it was a while ago, and ya, the final score says comfortable blowout, but it was a fun game, with Notre Dame showing a lot of heart (after a lot of nerves). I sure hope the ridiculousness between the two coaches/programs fades like so many family blowups. Some of the good news: ratings. Now, for those who are moaning, “oh, here we go again, UConn is “bad” for women’s basketball,” I simply say: don’t ignore what happened with the REST of the teams this past season. Lots of parity. Lots of young coaches. Next step: demand excellence from them. Raise expectations. Identify best practices. Stop complacency. Push for Title IX compliance. And hope for a little bit of luck and courage in the recruiting wars. ....even though South Carolina was regarded as the favorite to land Wilson — a 6-foot-5 forward from the Gamecocks’ own backyard in Columbia, S.C. — the fact that she really did stay put is a big victory for coach Dawn Staley’s program. It matters from a national perspective, as does the fact that UCLA has signed what’s considered the top-ranked recruiting class for 2014. The Bruins are also underdogs in women’s hoops that fans of the sport in general will root for to provide more diversity at the elite level of Division I.
I keep using terms like “fans of women’s basketball in general,” which might sound nebulous. But after so many years of following the sport, I think I have a pretty good handle on who they are. Intriguing case in point: Diamond DeShields’ decision to transfer from North Carolina. Clearly, the actually reasons behind her move is still to be revealed, but it’s hard not to speculate (homesickness? looming NCAA sanctions?). Mechelle reflects on her interviews with Deshields this past season. Remember when the news broke in May 2012 that four blue-chip juniors all decided to commit to North Carolina’s women’s basketball team? Diamond DeShields was the point person in bringing them together, and it appeared to be a lottery-jackpot day for the Tar Heels. DeShields, Allisha Gray, Stephanie Mavunga and Jessica Washington — ranked third, eighth, 15th and 17th, respectively, in their 2013 recruiting class — were all headed to Chapel Hill, N.C.
Well, it might have crossed your mind that day — it did mine — that when a group of teens makes long-range plans to do something complicated together, it might go awry. Not being ageist; it’s just that kids are kids. We’ve all been there. Good news for Purdue: Hamby, Bays on the mend. I was saddened to hear the news of coach Joe Curl’s passing. Most within the basketball world knew of his health struggles. They forced him to step away from his position as Houston Cougars’ coach. He came into national prominence during the 2003-04 season, where he and three-time C-USA Player of the Year, Chandi Jones, led the Cougars to the second round in the NCAA tourney and earned AP National Coach of the Year honors. 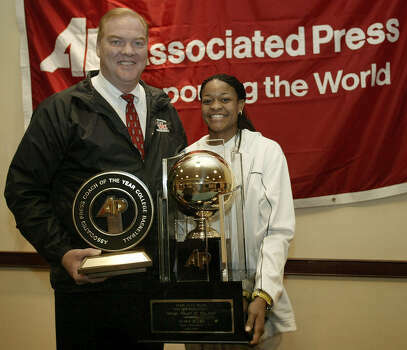 I remember him smiling as he picked up the award, almost embarrassed at being surrounded by press and the “elite” of basketball — Alana Beard was the AP’s NPOY. I was not surprised by Terri Mitchell’s dismissal from Marquette — she never quite seemed to be able to break through within the recruiting ranks. I wonder if she’ll thrive better on different soil. We shall see if the Anonymous Eagles’ impression (Marquette has decided that being middle of the road in team sports is no longer acceptable.) is correct. Congrats to Natasha Adair, who’s moved from the College of Charleston back to Georgetown. Here’s hoping she can grow a program that seems to have lost the ground that Terri Williams-Flournoy seemed to have gained. Does the athletic department triply give a hoot about women’s basketball? I remember Maren Walseth from the first Final Four I attended (2000 in Philly). She’s now the head coach at North Dakota State University. Interesting tidbit: Walseth’s sister, Annika, played for NDSU during the 2007-08 season. Keep Fresno State on your “watch list,” as they plucked Jaime White from Northern Colorado. Leticia Romero has known she wanted to transfer for several weeks, but she will have to wait a little longer to find out if Kansas State will grant her a release from its women’s basketball program. Romero, a rising freshman from Las Palmas, Spain, decided she wanted to leave K-State after the Wildcats fired Deb Patterson, the coach she signed on to play for, but the athletic department denied her initial transfer request. On Wednesday afternoon, she took her case to an appeals committee led by K-State Vice President of Student Life Pat Bosco. As of Wednesday night, the committee had not informed Romero of its decision. In WNBA news, Nate ranks has his 2014 Draft recap: The big winners and great value drafts (Spoiler alert: Connecticut, New York and Seattle do well). Have you read Griner’s book “In My Skin” yet? Did you read Kate Fagan’s piece on Griner: Held Up n Customs: Live in China Gave Brittney More Than She Bargained For. THE NUMBER OF moving obstacles at a busy intersection in China can feel paralyzing for a pedestrian. None of the cars, mopeds or bikes appears to be following the traffic laws, which makes stepping off the curb a game of chance, like real-life Frogger. And Brittney Griner is about to step off the curb. Welcome to Chicago, Markeisha Gatling. And be careful! It’s been tough sledding for Chicago Sky centers lately. Gatling, a 6-foot-5 rookie center out of North Carolina State, was selected by the Sky Monday with the 10th pick in the WNBA Draft. What seemed at the time to be a rather nondescript addition, compared to last year’s blockbuster selection of superstar forward and eventual rookie of the year Elena Delle Donne, could now be a key piece to the puzzle for the Sky, which opens its season on May 16 with a home game against the Indiana Fever. Gatling could be counted on heavily. And right away. For only the second time in its 30-year history, the Women’s Basketball Coaches Association (WBCA) will transition to a new chief executive. Beth Bass, who succeeded founding CEO Betty F. Jaynes in 1996, has announced her decision to resign. Board president Sue Semrau, head coach of the Florida State University women’s team, said that the board accepted Bass’ resignation and expressed thanks for all that their longtime CEO has accomplished during her tenure. Well, wasn’t THAT an interesting night! While “Trader Joooooeeee, Trader Joe” was running through my head at the Tina Charles-to-NY news, other actions just made me shake my head. Truly, it’s going to be an interesting season in the W as all these moves shake out. Now, time for folks to try and anticipate what it will all mean. On the same night when the Washington Wizards soundly defeated the Miami Heat, 114-93 at Verizon Center, Mike Thibault and his staff were in the same building, busy at work trying to improve the Mystics for the future. In a video interview with Monumental Network’s Casey Phillips which you can see above (click here for the video if you cannot see the embed above), Thibault gives his breakdown of what their first round draft pick, Stefanie Dolson, and their acquisition of Bria Hartley and Tianna Hawkinsbring to D.C. this summer. WNBA draft profile: How good can McBride become? The Western Conference has tended to grab a lot of the headlines in the WNBA and currently boasts the defending champion — and still formidable — Minnesota Lynx. But at Monday’s WNBA draft, most of the intrigue came in the Eastern Conference. That involved both veterans and draftees finding new homes. None bigger than Connecticut’s Tina Charles — the 2012 MVP — who is going to New York, her hometown. This was a move the Sun said Charles forced, and it added to the youth movement at Connecticut. Before getting primped for the night, Chiney relaxes on a couch overlooking ESPN’s draft setup with Baylor point guard Odyssey Sims, who was taken No. 2 by the Tulsa Shock. They talk about all the things they’ll do once they’re in the WNBA, like putting their paychecks into their savings account and changing their eating habits. “Yeah, but it takes too long,” Sims replied. “When I’m hungry, I’m hungry.” They both laugh. “I’m right there with you,” Chiney said. Later, after the two were selected 1-2, they hug each other in the hallway outside the draft set. Sims sheds a few tears. Tina Charles refused to play for the Sun anymore. “We were told [by Charles’ agent] that if she was not traded, she would sit out,” Mohegan Sun CEO Mitchell Etess said Monday night after the Sun sent Charles, 25, a restricted free agent, to the New York Liberty for Alyssa Thomas, Kelsey Bone and the 2015 No. 1 pick. And may I be this first (WHB blogger) to put in a request that Nashville host again… SOON! There’s just too much to see and do and I only have two feet and 24 hours in a day. So, after a Holiday Inn breakfast that included bacon (!) and scrambled eggs (!) and biscuits (! ), the rest of Monday morning was spent plotting and planning with two fellow basketball nuts. The brainstorming and opinionating was fast and furious (is there any better kind?) and we even managed to extract a couple of doable action steps. Watch this space for future actions in support of building women’s basketball attendance. I then joined a small cohort of friends from the midwest and we *tried* to take in the Country Music Hall of Fame. There’s just too much stuff (and, said my Nashville friend, I didn’t push enough of the buttons). I’m not sure why I didn’t know about Bakersfield and the music business, nor why I didn’t connect the impact of the Dust Bowl on west coast music and filmmaking, but I’m glad that significant gap was filled. As for the games: I don’t know if it came across on TV, but there was a golden, glowing ball surrounding McBride. What a sight to see. It was not so fun watching Maryland’s matador defense in action nor their stationary offense. Que paso? In the second game, Stanford came out confident and with a clear plan to slow the game down. And it worked beautifully, as Connecticut’s offense continued to stutter and start. But then that three rimmed out, and there was a missed layup, and before you knew it, I’m sure the phrase “patented Connecticut run” was being used by the game announcers. Unfortunately, having slowed down the game, the Cardinal couldn’t speed it up when they needed to catch up. Highlights: The Firecrackers, a fabulous group of jump ropers, the marching band from local TSU, and Kiah Stokes – who was my “player on which the game turned” nominee. McBride’s performance was THE highlight, though. We exited the arena into a drizzling rain (boo!) and hustled our way to the fancy, shmancy Omni for a post-game beverage and game dissection – only to find there were no late-night beverages available. Luckily, the staff was susceptible to my subtle NY charm and hangdog puppy face. Five minutes later we were sipping lovely martinis and leaning up next to a fireplace de-damping. Ahhhh…. Monday morning I put on my “yah, I’m on vacation, but I can do a little of my ‘real’ work if ya want.” Met friend Lattie to lead a session on questions and questioning with some fabulous teaching artists who work under the auspices of the Tennessee Performing Arts Center. Far too little time — and SO much fun to be with them — but Lattie did treat me to some yummy Asian fusion and a walk through the extraordinary Nashville Public Library. And I do mean extraordinary. A new building that fits it seamlessly with the surrounding architecture — it reads 1930s — it manages to be “classical” without dominating or overwhelming. Best of all, it has a PUPPET THEATRE!!!! The library has a tradition of puppetry – initiated by a gentleman to loved to use puppets to engage young children. The new library honored that tradition is a delightful way. I had a chance to meet the amazing puppeteers and see their exquisite puppets. Oh, to have seen their show String City: Nashville’s Tradition of Music and Puppetry. Squeezed in another meeting of mind — this time “women’s basketball history” nuts. What a delight to meet FOB Ellyn and talk history and research and ethnography and Susan Cahn and oral history and… well, just talk history. What more could you ask? So, if anyone reading is a good grant writer – or just has some extra cash they’ve been wanting to invest in a great cause – this is what we want: $50,000 to help capture the oral histories of women’s basketball. (Sort of a “StoryCorps of Women’s Basketball. )” We want to take advantage of reporters or educators and their love of stories and say, “Here’s $250 – go spend a couple of hours with this person (perhaps an area/neighborhood person) and get them to talk about what it was like to play, organize, officiate, manage, advocate and legislate for women’s basketball.” We’d then have them upload it and have the interview magically transcribed and catalogued.” (About $250 an interview). Simple, no? Oh – and all this plotting and planning happen in the exquisite Hermitage Hotel. A kind staff member gave us a thirty-second tour, that turned in to a discussion of NCAA, unions, the women’s suffragette movement with, of course, a little women’s basketball history tossed in for good measure. Wheee! The day continued with delicious food (are you noticing a recurring theme on this trip?) at City House in Germantown. Knowledgable and friendly staff, intriguing beverages, too much food (meaning, there was no room for desert! *sad face*) Since friend Lattie was our guide, we got to make another too-quick pass through another part of the oh, so impressive Centennial Park — I really liked the timeline. We capped off the evening with a Nashville tradition: the Time Jumpers at Third and Lindsley. Wow. Just wow. And the verse they added to Henry Strzelecki’s Long Tall Texan? Priceless… Thanks Vince and company! A quick look at the basketball news before turning out the lights made my head spin and my eyes go wide. When I randomly wondered if some reporter would be ridiculous enough to ask Geno and Muffet the “If you were driving and saw the other coach on the side of the road with a flat tire would you stop question” I was KIDDING. What on earth happened in the bowels of the Bridgestone during the off-day media circus? Will Achonwa’s absence hurt Irish? Can Irish keep up with Jefferson? Wicked early flight meant getting up wicked-er early, so I’m looking forward to a nap soon. It’s chilly-greening-spring here in Tennessee – 40 or so when we landed, but the Final Four greeter promised us 64 by noon. When you’re in the sun, yes….when you’re not? Brrrrrr! With time to kill before the hotel opened up, drove into, through and around downtown Nashville. Small and bustling at the center. Different, more concentrated vibe than when I was in Knoxville for the WBHOF induction ceremony a while back. Strong mix of old and new architecture. Continued our wandering exploration and end up driving past Vanderbilt (yes, as we researched, started by THAT Vanderbilt – hence the “Commodores” nickname.) Did you know the campus was also an arboretum? Did a quick drive through – really, really lovely. Also stopped by Centennial Park to visit the Parthenon and did some walking. Yup, it’s big. Nearby lake is being dredged/cleaned, so that wasn’t so scenic. It’s early for birds – but there is a list: Robins, Blue Jays, a lone Turkey Vulture, cackling Grackles, some beautiful Bank Swallows, noisy Northern Mockingbird, a gregarious Carolina Wren, and an early Hermit Thrush. Next on the agenda, the aforementioned nap, then a return to East Nashville to partake of the fare at the Eastland Cafe. Then, we’re off to the Grand Ole Opry! Hoping tomorrow features a visit with a WBHOF inductee, coffee, brunch, barbecue and two fabulous games. WOOT! WOOT! WBB HISTORY!! Nashville Business College: Champions before their time – LONG BEFORE TENNESSEE AND UCONN, THESE FARM GIRLS DOMINATED WOMEN’S BASKETBALL AND THEIR RECORD IS UNMATCHED TODAY.